Simply put, an allergy occurs when your body’s immune system develops an acute hypersensitivity to harmless substances in your environment. Allergic reactions can be triggered by house dust mites in your bedding, grass pollens in the summer breeze or peanuts taken in the diet. In-day-to day life, these substances would usually pose no threat, but if the body “mistakenly” feels under attack and responds with a severe hypersensitivity, then this can result in a life-threatening reaction as the body releases destructive chemicals causing swelling, itching, rashes, low blood pressure, throat closure and breathing difficulties. Some families are called “Atopic” as they have a genetic predisposition to develop allergies such as food allergies, eczema, asthma and hay fever. Many conditions including asthma, hay fever, sinusitis, eczema, hives, stomach aches can be caused by one allergy or another. If we can identify the allergic cause then the treatment will be easier and ranges from simple avoidance, to desensitisation and symptom control via specific medication. For example if a new kitten is causing your asthma to deteriorate, then it makes sense to find a new home for the cat rather than take medication every day of your life; and if grass pollen is the problem, then being desensitised to grass pollen may induce a state of tolerance and reduce or eradicate the need for antihistamine tablets, eye drops and nose sprays. Beware of unsubstantiated allergy tests of no diagnostic value as they lead to unnecessary dietary restriction and malnutrition in children. There is a risk that young people with psychological-based eating disorders “feed” into so-called food intolerance tests which more deeply entrench their eating disorder. 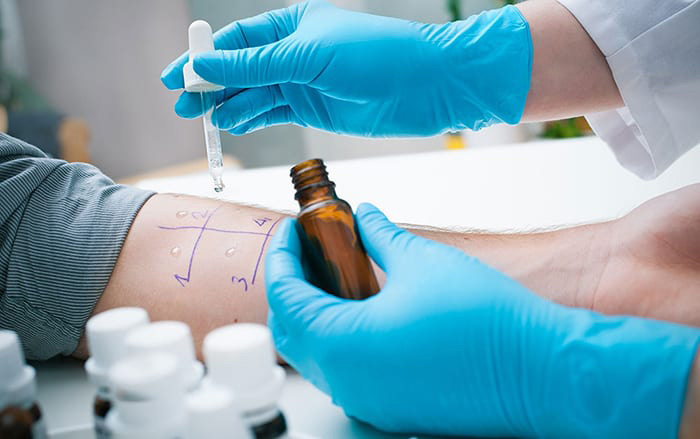 Skin Prick testing is the oldest and most reliable form of allergy testing. Extracts of inhalant and food allergens are applied to the skin in droplet-form and the skin is then superficially “pricked” using a special blunt lancet. This allows some of the droplet to penetrate the outer layer of skin and set up an allergic response if allergic to the allergen. The response results in an itchy bump the size of your little finger nail if allergic and nothing at all will happen if not allergic. We test for various inhalant allergens such as house dust mites, pet dander, pollen from trees, grasses and flowers, mould spores and feathers. The commonest food allergens include dairy, egg, wheat, gluten, soy, nuts, seafood and yeast and all of these are included in our testing. Any number of allergens can be tested and fresh fruits, nuts, vegetables and exotic foods can be used to create a testing extract. So if you have a specific product or food you suspect, bring along a raw sample and we can make an extract. After the test, the itchy bumps will disappear within 45 minutes. Children can accurately be tested from the age of 4 months. All antihistamine medication must be stopped for 2 days prior to skin prick testing. Intradermal Tests are a form of skin prick testing, where a trace of the allergen is injected into the skin to raise a small bleb. If allergic, the bleb will itch and turn red. This test is mainly used in local anaesthetic and antibiotics allergy testing, when the skin prick test is negative but an allergy is suspected. If there isn’t a skin prick test available, or the person has bad eczema and the skin cannot be tested, then we recommend a RAST (Radio-Allergo-Sorbent Test) on a blood sample. This test detects specific IgE antibodies produced by the body’s immune system. The problem with this test is that you get a lot of false positive results (the test shows a low grade of reactivity, but you are able to eat that food or be exposed to pollen without reacting). The modern CAP technology is now used and local Pathology laboratories process these tests, such a Lancet, Pathcare and Ampath in South Africa, All these tests are covered by Medical Aid Insurance and over 400 individual CAP RAST tests are now available. Measuring Total IgE – a word of caution: We historically made use of Total IgE as an indicator of probable allergy. Although this test is positive in many allergy sufferers, some people with no allergies can have non-specifically raised Total IgE. For example in non-allergic eczema we can see very high levels of Total IGE, whereas in allergic rhinitis, the Total IgE may be paradoxically low while a specific IgE test for pollen is more accurate. New Component allergen technology can determine exactly to which part of the allergen you are reacting. Some parts are more allergy provoking than others and determine if the allergy is likely to persist or go away, or whether you will have a severe or mild reaction. This is very helpful information when managing insect stings, peanut allergies as well as wheat, fruit and oral allergies. It also indicates whether oral or injection desensitisation immunotherapy is likely to work or not. Allergen Patch testing (APT) is usually used in allergic Contact Dermatitis to check for skin allergies to metal, cosmetics, soaps, hair dye, topical medication, rubber, glues and perfume. The test used is the European standard TRUE test which involves sticking 24 different chemical allergens in Finn chambers to the skin of your back. The patches remain in place for 2 days (48 hours), they are then removed and the skin is assessed after a further 24 hours for micro-blisters which indicate a specific contact allergy. This Patch Testing shows up delayed T-cell hypersensitivity responses. Patch testing has been used to detect delayed food hypersensitivities in children such as to dairy, wheat and soy. If used together with Skin Prick Testing is offers a greater degree of diagnostic accuracy for delayed food allergies in children such as Gastric Reflux, Colic and Eczema. Challenge testing is the “Gold Standard” for allergy testing; this is when you are actually exposed to the suspected allergen in a controlled manner. This could include having traces of pollen sprayed up the nose and into the eyes or being given a minute taste of peanut butter. Challenge testing should not be tried at home, but rather in a controlled medical environment, in case you react severely. If a reaction occurs, the challenge is stopped and antihistamine medication given immediately. The best (and most accurate) of all test is the “Double Blind Placebo Controlled Challenge Test” where neither the patient nor tester knows what is in the test product and what is placebo. This removes what is called “Bias”, as we human beings tend to pre-judge circumstances and may automatically feel itching if we eat a food we suspect to be a problem or to which we may have an aversion – thus psychological factors may impact on the test result in a non-allergic manner with shortness of breath, itching and getting into a panic and hyperventilating. RAST tests and Skin Prick testing cannot accurately determine allergies to most chemical preservatives such as sulphur dioxide or sodium benzoate, nor food colourings, MSG, aspirin and antibiotics. The less well-known CAST test (Cellular Allergen Stimulation Test) using ELISA or Flow CAST technology is available in South Africa and may be helpful for non-IgE allergies. Allergen is added to a blood sample and if hypersensitive, Leukotriene inflammatory mediators will be released by Basophil blood cells, and this chemical mediator can then be measured in a laboratory. The problem being that the test results can vary, especially if antihistamine medication has been taken or if the person recently had an allergic reaction. CAST testing has a good positive predictive value (so if the test is positive this indicates sensitivity, but if the test is negative, this does not necessarily exclude a sensitivity). In an acute allergic reaction or anaphylaxis, the body releases pro-inflammatory chemicals called Histamine and Tryptase. Histamine is rapidly metabolised and difficult to measure in the blood, while the levels of Tryptase last for 6 hours in the bloodstream after an allergic reaction. So if an acute allergic reaction is suspected but no-one is sure, then we can measure Tryptase in blood samples. During anaphylaxis, the Tryptase usually goes up by 100% from the baseline level and this might occur during or after an anaesthetic allergy, injection of penicillin or death from peanut anaphylaxis. This is a very useful forensic tool to determine whether an allergy took place in circumstances such as in unexplained Restaurant, Anaesthetic or Cot death. Lactose & Fructose Intolerances are the inability to digest the cow’s milk sugar lactose and/or the fruit sugar Fructose – which results in abdominal pain, unpleasant wind and diarrhoea within an hour or so of consuming these foods. Some children can develop temporary lactose and fructose intolerance after viral gastroenteritis, while in other children, if consuming too much fruit juice daily, they will develop fructose osmotic diarrhoea. Many adults of Caribbean and North African descent as well as Mediterranean and Asian communities have a genetic predisposition to be unable to digest lactose. There is a genetic test on Chromosome 2 which can pick up those at risk. It is possible to do a challenge test and measure the lack of lactose absorption in the blood (this test is done by a pathologist). The hydrogen breath test which involves measuring hydrogen from fermentation of unabsorbed lactose in the gastrointestinal tract is very difficult to standardise and not readily available. A simple solution in children is measuring acid and unabsorbed reducing sugars in a diarrhoea stool sample shortly after consuming lactose – hence the blood / breath test / stool samples needed for diagnosis. Lactose intolerance does not cause rashes or breathing difficulties. Gluten is part of the wheat molecule and found in breads, it may occur in barley and rye, but less likely in oats. Certain people are sensitive and this gluten fraction causes delayed gut hypersensitivity with some of the upper bowel lining being damaged, and this can cause severe abdominal pains, constipation, diarrhoea or bloating. Some gluten intolerant people may have more subtle symptoms or malabsorption with anaemia, vitamin deficiencies and fatigue but minimal bowel symptoms. They may even have an itchy raised rash called Dermatitis Herpetiformis. If gluten intolerance is suspected, then one can do a blood test for Tissue Transglutaminase IgA and IgG and also an HLA genetic test indicating risk. Don’t be fooled by a growing number of tests that purport to detect food intolerances. These tests such as Imupro measure harmless IgG antibodies to foods and these antibodies are a normal phenomenon and have no allergy or intolerance diagnostic value. The results usually look impressive with coloured graphs and almost always tell you to avoid essential foods such as wheat, dairy, yeast and sugar. Imupro is an IgG screening test and is marketed in South Africa but not endorsed by the Medical Council of South Africa nor the Allergy Society of South Africa (ALLSA). Another test also of no proven value in diagnosing allergies according to ALLSA is the ALCAT test used to detect food intolerances implicated as a cause for obesity. VEGA testing uses a computerised probe applied to an acupuncture meridian on your finger. Live Blood analysis by microscope, on a blood sample looks for parasites and rouleaux formation. Iridology – the examination of the patient’s iris supposedly flags up organs under stress. Melisa blood test allegedly detects sensitivity to heavy metals, dental fillings and orthopaedic prostheses but has never been proven to be accurate. Extensive stool analysis for parasites and chemicals is usually processed in United States and then blood Rickettsia bacterial antibody testing also processed in Belgium but both are unproven diagnostic techniques.